Author Ravi Subramanian has gravitated from his bank related thrillers to other genres from his previous novel ‘The Best Seller She Wrote’ exploring and exposing the good and bad sides of the writing world now. 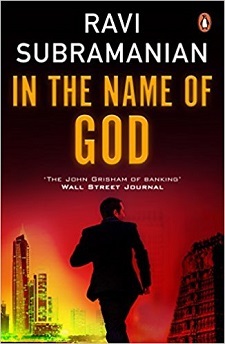 His latest offering ‘In the Name of God’ is another milestone in Ravi Subramanian’s powerful writing in bringing together certain unconnected incidents like a blast in Mumbai, a heist in Dubai Mall, a search in the hidden wealth of astronomical value in the vaults sanctimonious Anantha Padmanabha Swami Temple in Thiruvananthapuram, the trade of diamonds, and the smuggling of idols from Tamil Nadu to foreign countries. The successive murders of two persons connected with the audit of the treasures in the Anantha Padamanabha Swami temple in Thiruvananthapuram open a Pandora’s box. CBI officer Kabir Khan with the support of the DGP Krishnan, Kerala and Tamil Nadu police officer Madhavan investigates the case notwithstanding the innumerable hurdles and setbacks and brings out the criminals in the open. Trading, jealousy, deceit, love, transgression, faith, authority, arrogance, intelligence, rationality, religion are intertwined very smartly throughout the novel. One of the most appealing aspect of this novel is the chapters are pretty brief and each chapter almost ends with a cliffhanger. The awesome scope of the electronic media and communication system and their usefulness in such tricky situations are brought out in an interesting manner in this thriller as in his earlier ones. Ravi Subramanian’s simple but elegant way of narration is the high point of the story. Quotes like ‘Love and fear often bring out the same reaction- compliance’, ‘Often in matters of death, rationality takes a beating’, ‘In every religion, people killed in the name of God’ and many more exclusive to Indian milieu make the reading engaging. The conversation between the King Dharmaraja Varma and Kabir Khan was very brilliantly worded. The last few chapters race at breakneck speed with several twists to a dramatic and unexpected climax and epiphany. A word of caution before reading the book; one should have a grasp and good memory power to enjoy the novel as the characters and the colors are too many and that may likely to make the reader either confused or frustrating. Probably, that is the strength as well as weakness of the novel. This novel among the several fictions spun on cloyingly romantic themes emerges as a tale with strong storyline, suspense, thrill and drama. Ravi Subramanian never lets his readers down. ‘In the Name of God’ is another feather in the writer’s cap.